The ripple effect of growing environmental concerns extends upstream the supply chain from consumers to retailers, through to packaging producers. The global trend toward environmental awareness spurs growing demand worldwide for eco-friendly companies and products. Green packaging has received much attention in recent years, with environmentally-conscious consumers demanding sustainable packaging solutions. Going green, however, is no longer merely a social responsibility, it is also a means to be more efficient, cut down unnecessary waste, better use and re-use resources, and reduce excess costs across the supply chain. 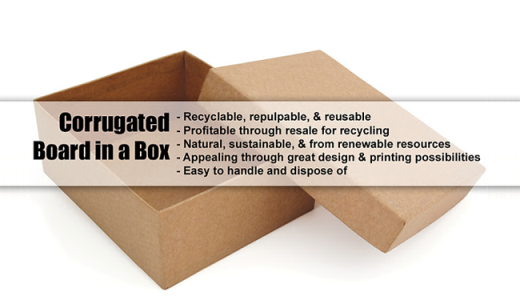 Corrugated board has risen to the challenge in eco-friendly packaging solutions. Corrugated board packaging, made from natural and sustainable materials, is associated with recycling, re-pulping and re-using and thus perceived as eco-friendly. In addition it is light-weight, easy to handle, ship, and dispose of. In addition, it provides great flexibility and endless possibilities for design and brand recognition. Nowadays, used corrugated board is in demand, thus proving profitable for retailers. Retailers benefit from re-selling corrugated board waste to tissue mills and paper making companies that in turn re-pulp or recycle waste. Issues concerning un-recyclability of wax-coated corrugated boxes for packing poultry, meat, and seafood, as well as agricultural and floral products have been countered by innovative wax-replacement corrugated packaging. Being environmentally aware, it is important to ensure that materials’ used for corrugated packaging and paper products come from certified sustainable forests. Today, certifying bodies are tracing wood and wood-based materials back to forest of origin. Forest Stewardship Council (FSC) and Program for the Endorsement of Forest Certification (PEFC), international non-governmental organizations (NGO) promoting Sustainable Forestry Management (SFM), provide such certifications. INDEVCO Paper Containers is a division of the multinational INDEVCO Group that manufactures corrugated packaging.